I try to take in a couple car shows each year. Naturally, I enjoy walking among the cars. 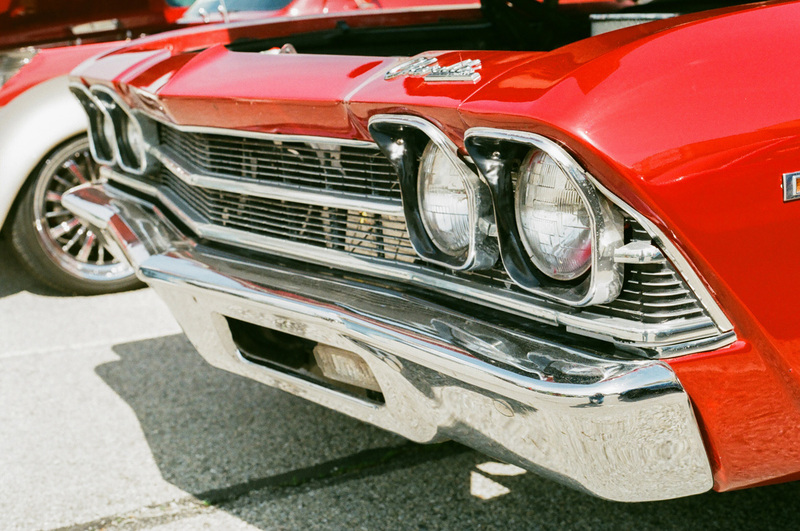 I also I love to load film into one of my old cameras and make the cars my subjects. 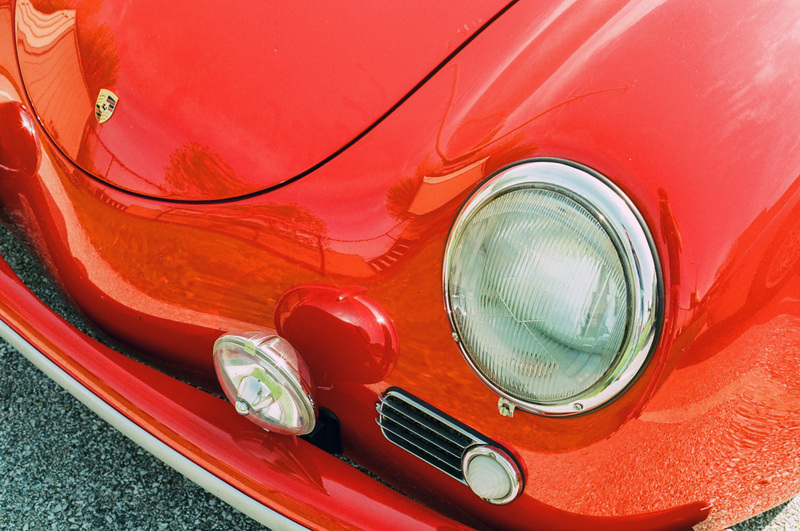 I especially like to move in close and capture details, as on this Porsche Speedster. Was that Speedster ever photogenic! I could have made it the subject of a whole roll of photos. For this outing I got out my Canon AE-1 Program. If you’ve ever owned one of these, you know it’s a fine and capable camera. But I seldom use it. I reach for one of my Pentax SLRs much, much more often. Or maybe one of my Nikons. I collect film cameras, you see. I own far, far too many — more than 100 at last count – and storage has become a real problem. I’m shooting them all one more time and getting rid of the ones that don’t sing in my hands. This day, it was the AE-1 Program’s turn – and while it functioned flawlessly, it didn’t sing like my Pentaxes and Nikons do. This was its last outing with me; I’ll sell it on. For the other film photographers in the audience, I used the pictured 50mm f/1.8 Canon FD lens for these shots. 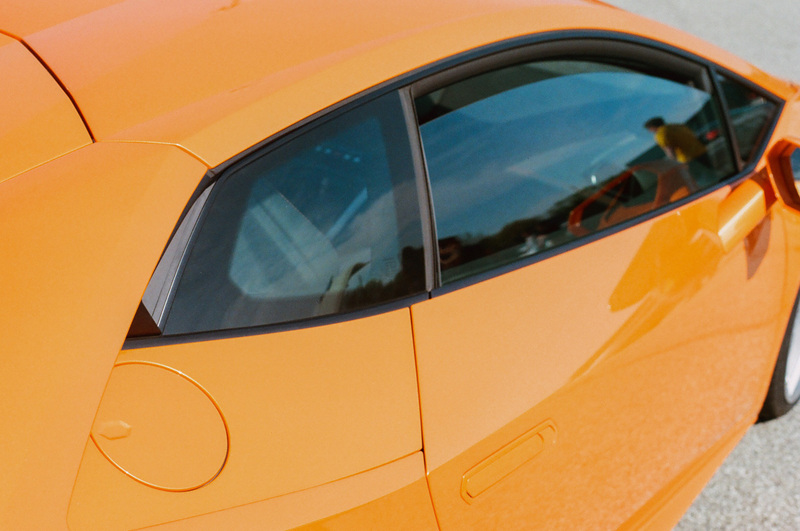 I shot Agfa Vista 200 film, but set the camera to ISO 100, as this film’s colors look best at one stop of overexposure. 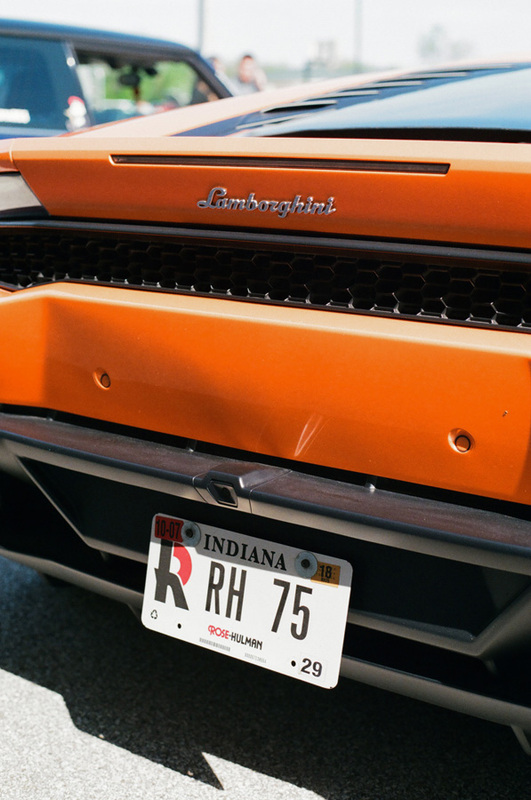 This monthly show, Indy Cars and Coffee, is casual: to show your car, just drive it over and park it in the lot. 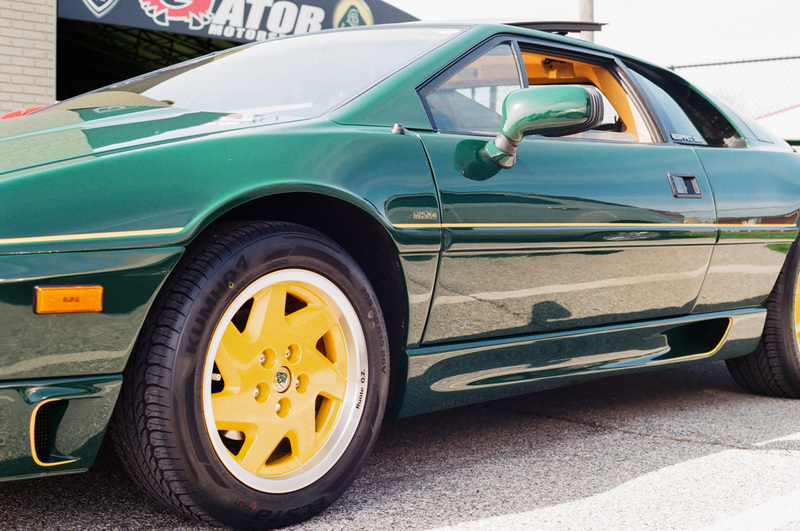 Even though the show is sponsored by a company that deals in exotics, it’s open to any car. So all kinds of cars were here this day, and it was common to see them moving around under their own power. Like this Thunderbird. 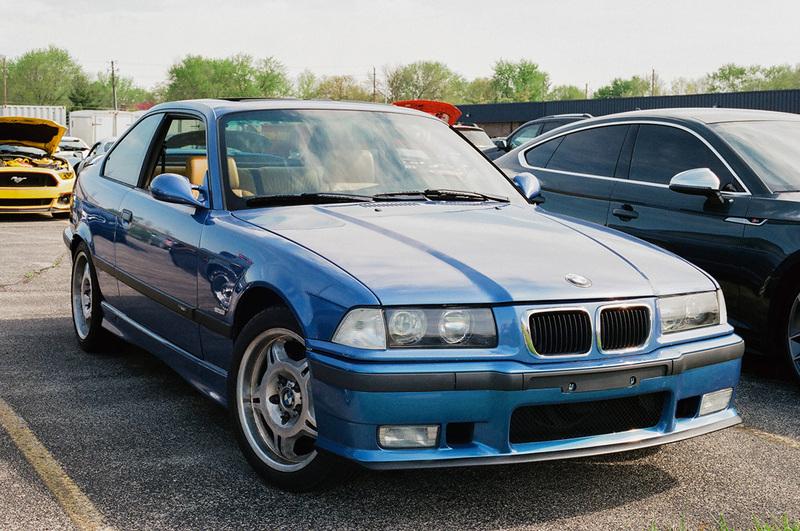 It brought out people from all walks of life, from rich kids in expensive clothes and precise haircuts who packed up to revel in the wealth that let them buy exotics, to everyday people who kept a classic. 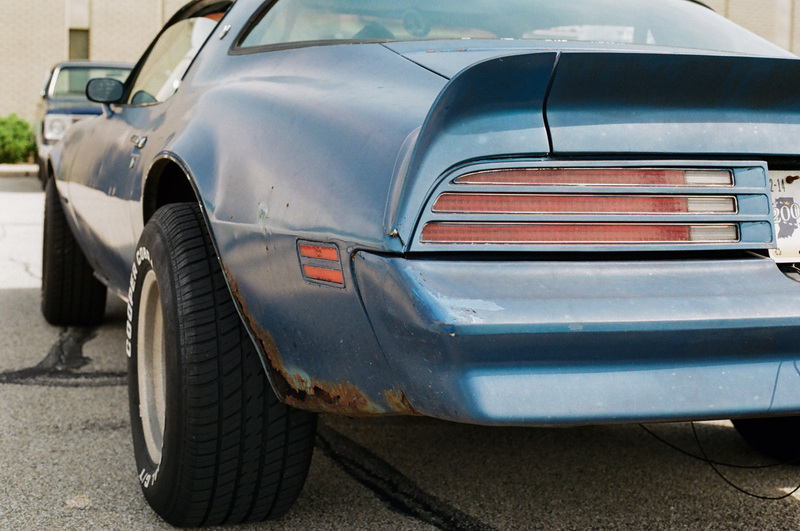 That brings me to my favorite car of the day: this Firebird. It was in rough, original condition. The young owner came upon me crouched behind his car’s rear flank and expressed his embarrassment over the rust I was photographing. Oh no, I assured him: the rust is what made me love it. I told him that when I was in high school in the early 1980s, the parking lot was full of Firebirds and other cars we consider classics today in just this condition. The fellow told me he worked construction and that this was his daily driver. He hoped to restore it one day. I gave him props and said was perfect now. 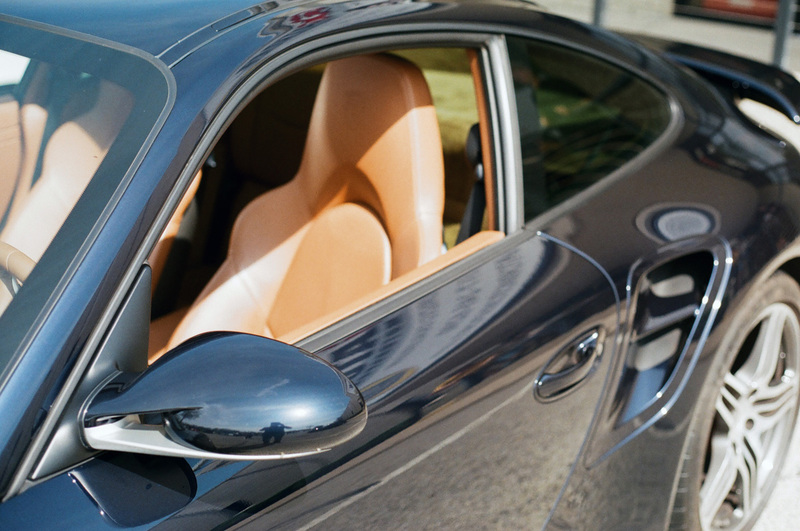 I fully felt my reverse snobbery, however, as I observed the roving gang of wealthy twentysomethings basking in each other’s very expensive cars. Having the means to buy something so expensive doesn’t say anything about you except how large your bank account is! And I just don’t feel any respect for that. My longtime friend Steve had a Porsche for a few years. He invited me into the shotgun seat a time or two and those rides were just lovely. But Steve wasn’t trying to be a member of any exclusive club. He was just a man who had always wanted a Porsche and had, in middle age, earned the means to buy one. When I was young I assumed guys like Steve were just trying to reclaim their lost youth. But now that I’m middle aged, I see that this is the age where a man’s career might finally have done well enough to let him afford his youthful dream car. Logically, I know that both those rich young men and guys like my buddy Steve just bought something they both wanted and could afford. It just seems more noble to me to buy something your hard work has let you earn. Look – my blue-collar roots are showing. Which brings me to this Lamborghini. You might remember that I shared an in-traffic photo of it in a recent post. The only thing I know about its driver is that he graduated from my alma mater, as his license plate attests. Props to him for driving it. I suppose that’s what everyone who showed their car here has in common, regardless of their economic background: they drove their cars in. No trailer queens here, not today. I respect that. This Chevelle? Driven to the show. 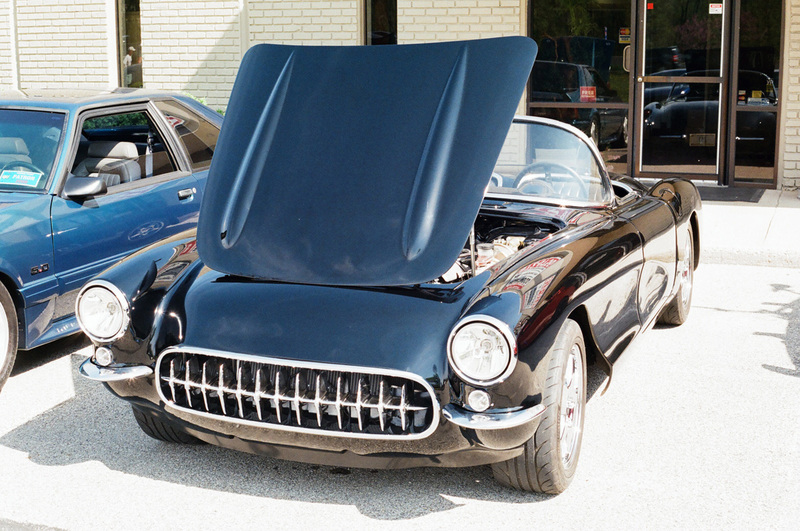 This Corvette? Driven to the show. This…whatever this is? Driven to the show. Actually, since I saw it here, I’ve seen it on the mean streets of Zionsville, the Indianapolis suburb in which I live, several times. But even this is one of my biases: why own a classic or exotic if you don’t drive it? Yet I know that you can do whatever you want with your car. Drive it, trailer it, keep it locked away where nobody can see it, firebomb it. It is, after all, yours. I’ll wrap with this, my favorite photo of the day, and just express gratitude to this group of classic- and exotic-car owners for bringing their cars out where others could enjoy them. I had a great time this morning. Disagree on leaving that cancer in the sheetmetal. That’s degenerative and at some point it will become terminal, taking one more classic off the road. That’s just not good. On the other hand, it won’t be on the road when it becomes a garage queen either. How many major projects get sidetracked indefinitely by “life got in the way” excuses? I’d rather see old cars in this form than nothing at all. Once they’re restored the owners are either too afraid to drive them or turn them into investment commodities only seen at stupid auctions. I miss film cameras every once in a while. You only had a certain number of shots available so you had to bring your A game every single time. I will say digital cameras made me a much better photographer though. Being able to shoot everything and junk the crap in real time let me take more risk. I probably learned more from the bad shots than the good ones. Ahhhhhhhhhhhh who can resist a Cadillac!!! I keep seeing mentions of this monthly event – and I keep forgetting to mark it on the calendar and making a commitment to go. Like you, the exotics just don’t do anything for me. Never have. But I have softened on them as I have aged. Also like you I know a guy who (last I knew) had a 1980s 911. He had a really good year and bought it, and has kept it for occasional use (and in pristine condition) ever since. He didn’t buy it to impress anyone. He bought it because he loved it. He still does, and I am glad that he was there to show me Porsche enthusiasm from the inside. 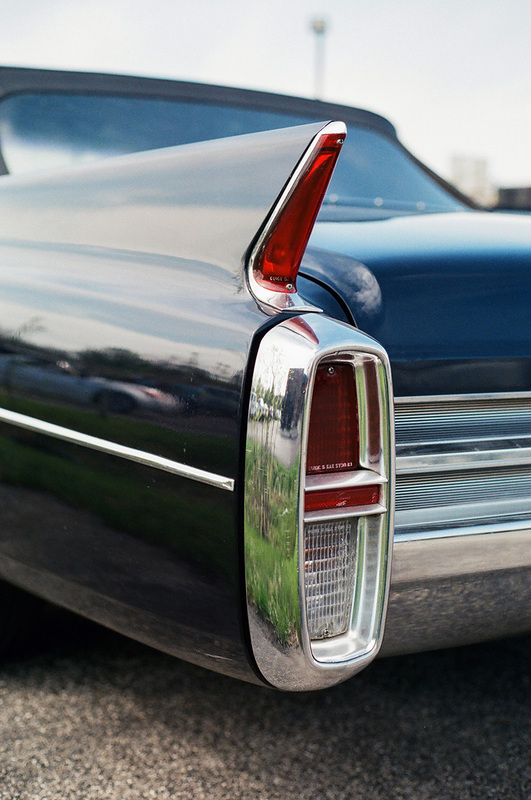 Oh, that white 61 Thunderbird – I wonder if that could be my old car? When I sold it mine looked great outside and fairly awful inside, and needed quite a bit of work to make it a regular driver. You never know. Let me know if you decide to go and I’ll try too meet you there! I can’t find the love for exotics either. As a matter of fact, I tend to shun just about anything on wheels with a value too much over 5-figures. 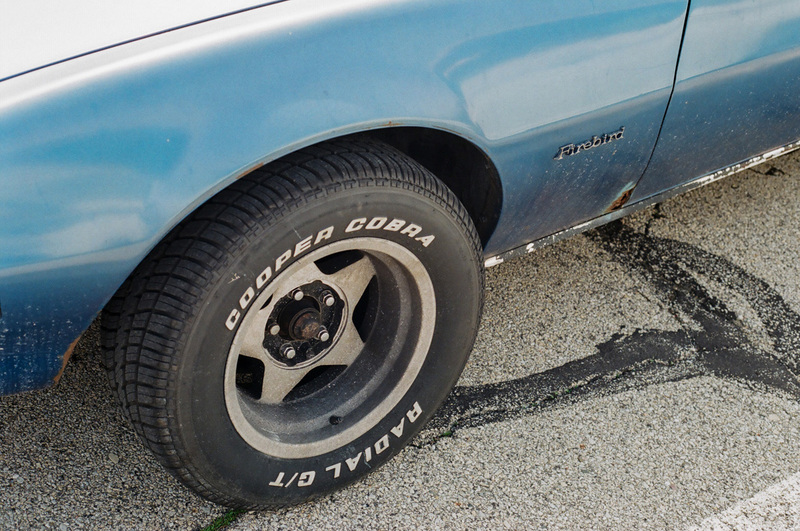 I grew up with guys who bought old muscle or special interest cars, wrenched on them behind barns and de-greased parts in their basements, shined them up (rust spots or not, flaws and all) in the Spring and enjoyed them regardless of their value. a few of those guys have pretty impressive and valuable collections today, but more of them have great memories, and maybe a dusty hulk or two in pieces in the garage or out in the pole barn for “when they have time”. Great photos, Jim, as always. Love that Cannon. 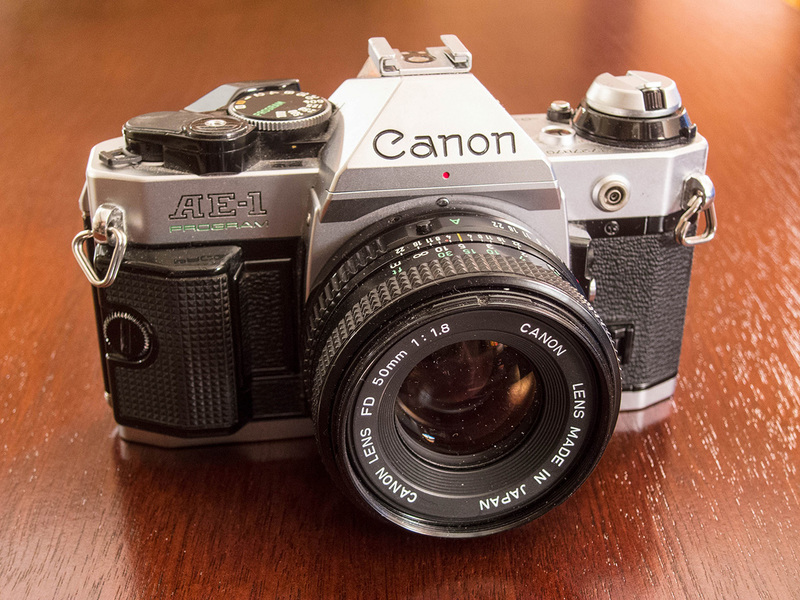 My Dad had its sister camera, the AV-1, and I loved to take it out and shoot a roll or two. I also loved my little Cannon QL-17 GIII rangefinder. I’ve become soft after years with an Olympus C700 digital with 10X Optical zoom, which I almost never get it out anymore. Like most everyone these days, my camera of choice is my iPhone, as it is as portable and convenient as they get. I do miss old school photography though. You can pick up a used SLR with a lens on eBay for under $50 and get back into it! 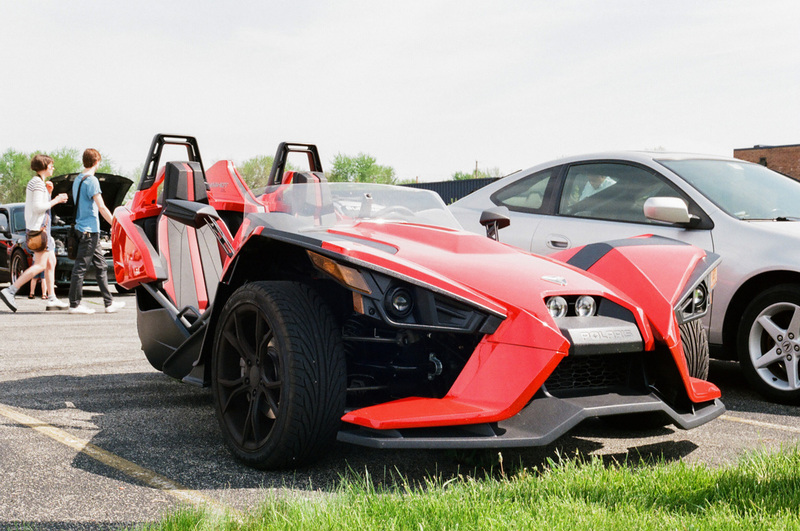 The next to last photo is of a Polaris Slingshot; according to their Website it has a 2.4 liter GM Ecotec four and a five speed manual transmission. It is registered as either a motorcycle or an autocycle, depending upon the state. As the weight of the vehicle is less than 1800 pounds I would assume it is fairly quick. I see those around occasionally. They look like a lot of fun. Maybe not practical, but that’s not the point either. Fun fact, at least in the state I live in, is that you are required to have a motorcycle endorsement on your license to drive (ride?) it. ‘Snobbery’ or no, I’d rather have that Jim Clark Indy 500 Esprit than any other car pictured here. This. Any shallow status-seeker can drive a near-new 911 or Maserati, but it indicates a certain knowledge, enthusiasm and dedication to own a three-decade old Lotus. One of just 20 made, too! As always, great pictures and assortment of cars, Jim. Thanks for allowing me virtual attendance. Agree. To be fair to those guys (and they’re almost always guys) most of them probably genuinely enjoy their newfound ability to have something they’d have lusted over as teenagers–and they should, since kids and mortgage will drastically reduce that ability in a few years. I agree about Cars ‘n Coffee Lambo repulsion. Over the winter in Arizona I go to four or so recurring events; each has a somewhat different character. The largest is at Scottsdale Road & the 101 freeway; it is becoming more pretentious every month. This includes snobbery over parking locations; commercial tents/tables representing car dealers, insurance, garages, auctions, and the like; car or racing “fashion”; young know nothings only interested in the Lambo/Porsche type new supercars; active and necessary staff & police monitoring/directing vehicles; special, fancy coffee vendors. The hot rods show up; they and their owners are pretty down to earth. There is great variety. I enjoy the 20 to 60 year old European cars and there are plenty. It is very crowded. I don’t bring a car; I ride a bike there. This event may attract 200 or more cars. The other events are a bit more civil and don’t have the young know nothings. One event, at the Pavilions shopping center every Saturday, is almost all American cars. One at a Penske dealership is almost all European. I like all the events but stay well away from the Lambos and the people they attract. When I am able to convince out-of-towners to accompany me to the Scottsdale Road event, they are always astonished. The younger “know nothings” can be a bit diificult, but I guess I tolerate them because I might have been like them three or four decades ago. Plenty of “older versions” of the same personalities at just about any car show. I can be confident that I will see the first example of any new enthusiast vehicle there whether it be a new-generation MX-5, a BRS, a Hellcat or a mid-engined Vette (I hope.). At the same time, there always seems to be a few interesting vehicles like a class-winning Abarth from one of the 1960s Targa Florio races and Studebaker pickups. 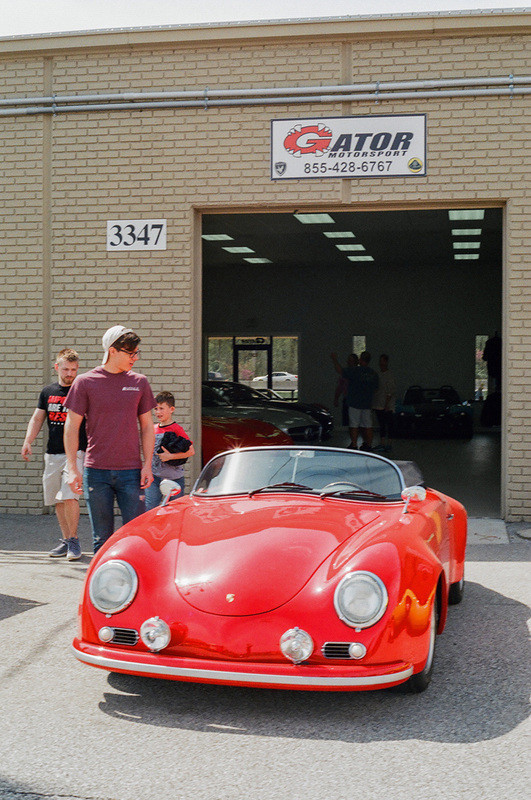 Whether or not you favor exotics, muscle cars, 50s classics, tuners or euro cars, it’s that broad range of iron and their enthusiasts that makes Cars & Coffee events so enjoyable. While some factions tend to clump amongst themselves, where else can you see a ’58 Ranchero parked ten spaces down from a McLaren 720? I don’t get the chance to see either of those very often. The important thing is that the attendees are all bound by their enthusiasm for cars. Re. exotic cars, especially late model ones, I concur. Not my style. Invokes the image of the swaggering oligarch children in London or Los Angeles blasting down streets and deafeningly revving engines while slowly cruising in gridlock.